This is third installment in a four-part series on Summit County’s Referred Measure 1A, which will soon appear on election ballots across Summit County. Mail-in ballots go out to voters on Oct. 14. Early voting is Oct. 20 through Nov. 3. Election Day is Nov. 4. Question 1A calls for $3.73 million in temporary annual funding for ambulance service and for 911 and water-quality system upgrades. Funding sunsets after eight years. The first part in this series, published Oct. 10, addressed the 911 system upgrade component of the proposition. Part 2 focused on ambulance service funding. Part 3, which centers on water quality, runs today. An overview of the entire ballot question will appear in Oct. 13 paper. This is the third installment in a four-part series on Summit County’s ballot item 1A. Mountain drinking water is supposed to be some of the cleanest, purest, tastiest water on earth. In Summit County, though, water and the greater environment face continued threats from toxic metals leftover from mining generations ago and hazardous waste improperly disposed of today. Summit County officials want to make it easier to protect water quality and clean up environmental dangers, so they’ve designated that part of the funding raised by the tax increase proposed in ballot measure 1A be used for those purposes. If approved by voters in November, the measure would enact a property tax levy of 2.417 mills for the next eight years. That means for each $100,000 of residential property value, property owners would pay $19.24 more annually. Of the funding raised, 17 percent, or about $630,000 a year, would go toward environmental protection efforts, including cleaning up the toxic impacts of old mines. In total, 1A requests $3.73 million in temporary annual funding for the ambulance service and upgrades to the 911 system, or almost $30 million before sunset. Assistant county manager Thad Noll said a little more than half of the environmental protection portion — or $300,000 a year — would go toward mining reclamation and habitat restoration projects, like the Pennsylvania Mine cleanup underway in the Peru Creek drainage near Montezuma and the Swan River restoration project along Tiger Road near Breckenridge. “We always go after lots of funding sources to pay for those things,” Noll said, describing a reliance on partnerships with other government agencies and nonprofits. The county doesn’t have a designated fund for cleanups and pays for its portion of project funding with money from the general fund or the Open Space and Trails Department budget, he said. One struggle the county faces when tackling such projects with partners is obtaining grant funding. The measure would give the county money to use for matching funds, which grant providers usually require before approving projects. Shaw has been involved with restoration projects for the Snake River, Swan River and Tenmile Creek, and he said he can’t think of a better reason to pay more taxes. 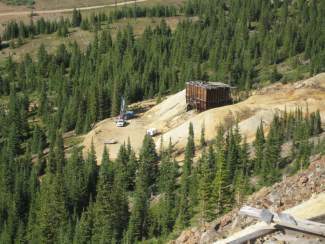 About four years ago, he said, the abandoned Illinois Gulch Mine experienced a blowout and turned the Blue River in Breckenridge red. Besides incidents like that, though, most water quality issues are nearly invisible. Residents and visitors are generally pleased to learn about restoration work done around the county, said Brian Lorch, director of the county’s Open Space and Trails Department. “We haven’t heard anything but glowing comments,” he said. The rest of the roughly $630,000 of funding raised every year from the measure would be used to encourage residents to properly discard household hazardous waste. Noll said the county would eliminate the current fee residents pay to drop off hazardous waste at the landfill and start offering disposal on Saturday mornings for those who can’t drop off waste Monday through Friday. The money would also finance a few hazardous waste collection events around the county every year. “We really want to make it easy for people to do the right thing,” Noll said. The county has tried various fee structures for hazardous waste disposal at the landfill, he said, with the idea that people generating more hazardous waste in their homes should pay more to dispose of it. That hasn’t worked. “Most people don’t want to pay that fee, and the fee doesn’t come close to the cost of getting rid of it,” he said. People end up putting hazardous waste like paint in with their garbage, throwing away pesticides in their yards and flushing prescriptions pills down their drains, Noll said, all problematic. Some things, like pharmaceuticals, aren’t taken out of the water pumped through the pipes for drinking, Stiegelmeier said, so it’s especially important to keep them out of the waste stream.